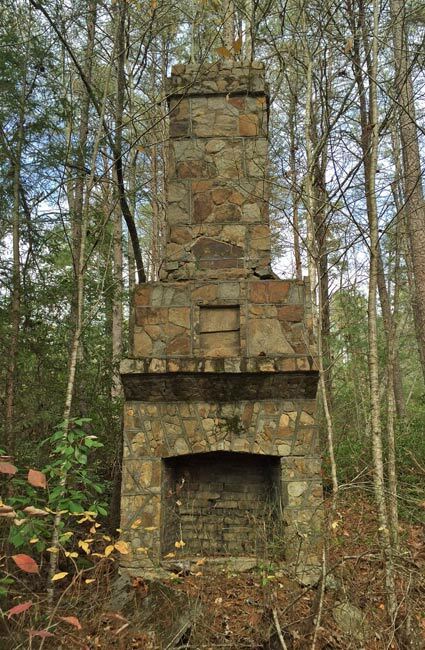 This masonry structure, dating to 1935, served as a bulletin board for the Civilian Conservation Corps (CCC) workers who stayed here while building adjacent Table Rock State Park. 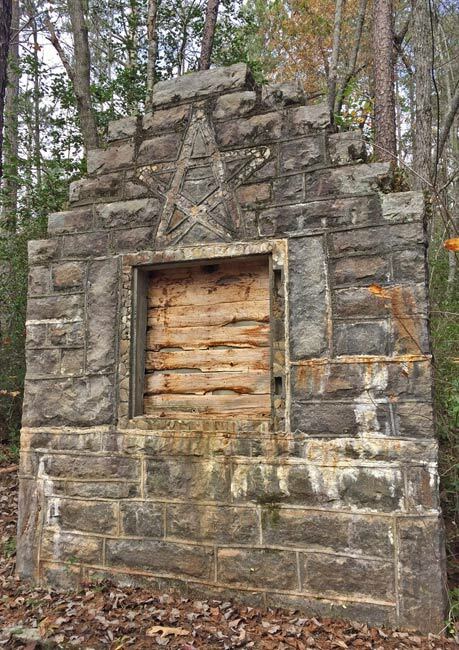 Ornate for its purpose, the stone frame of the bulletin board stands at eight feet tall, features a decorative star, and is one of the few remnants of this government camp site. 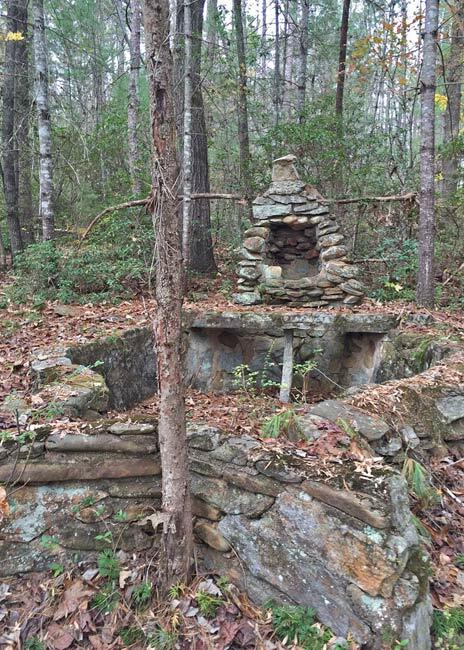 Located near the visitors center just south of the state park entrance, similar masonry artifacts, such as a chimney, a small grotto fountain, and steps, tell the story of the development of the majestic mountain retreat. Table Rock State Park, which opened in 1938, is one of sixteen South Carolina state parks built by the CCC. Developed as part of the New Deal, the CCC was designed to be a work relief program. This site was established to house two CCC camps, called SP-5 and SP-6, and occupied 10 acres of woods below Table Rock Mountain. Camp SP-5 worked on building and developing the park, while Camp SP-6 concentrated on building the dam and spillway at Pinnacle Lake. SP-6 disbanded in 1937 following the completion of the dam. SP-5 left in 1941, at the onset of World War II, due to a lack of funds for government programs. Both camps were initially comprised of World War I veterans; the former soldiers were later replaced by groups of younger men. This camp was built in the spring of 1935 when the United States Army developed the site on private land leased by the government. It was completed in time to receive the CCC workers who arrived that August. The site included a recreation hall, a welfare building, barracks, a bathhouse, a dispensary, and officers’ quarters. By 1936 similar camps were being constructed of pre-cut wood so they could be easily disassembled. CCC workers could quickly tear down these wooden camp sites and reassemble them at the next location. However, this camp was built the year before, and the solid masonry work was difficult to remove. As a result, these remnants still stand to remind us of those who toiled to build the park. The grotto fountain, which has a fish-shaped basin measuring nine feet in length, is pictured above. The recreation hall chimney can be seen below. All of the stonework was supervised my masonry foreman Doc Miles Newton. The site of Table Rock Civilian Conservation Corps (CCC) Camps SP-5 and SP-6 is significant as a remnant of the types of camps built as a result of New Deal legislation which allowed for CCC workers to be used in the construction of state, county, and municipal parks. It is also significant for its association with the construction of Table Rock State Park in Pickens County between 1935 and 1941. CCC Camps SP-5 and SP-6 were responsible for the development work of Table Rock State Park. They were established in the spring of 1935 and built by the US Army, prior to the arrival of CCC workers. The camps were located near the park property on private land that was leased at little or no cost. The camp buildings at Table Rock included a headquarters, welfare building, supply building, recreation hall, mess hall, barracks, officer’s quarters, bathhouse, dispensary, school building, wood-working shop, latrine, oil house, various sheds and facilitating buildings. Principal remaining elements include the recreation hall chimney, bulletin board with adjacent benches, grotto fountain, and basin. The site also includes a number of concrete slab foundations, stone piers, stone steps, and evidence of walkways.